I spoke to someone the other day about how we would be adjusting our family Christmas morning activities because of Christmas falling on a Sunday, given the fact that our church would be meeting for worship that morning. “You’re having church on Christmas?” she asked. She’s right, in a way. But is that bad? I’ve spoken with pastors whose churches are canceling services on Christmas morning, most so that they do not disrupt special family time. That’s an honorable and precious motive, but one which may be tilting in the direction of the not-too-glorious triumph of the family. As my friend, Geoff Henderson, has often pointed out, and does so eloquently in this context here, the church in an attempt to honor the family runs the risk of idolizing the family. Certainly left unchecked the church can become a hub of activity that draws husband away from wife and child away from parent. But an equal and perhaps greater danger is the ‘corrective’ that subtly communicates to our children that their personal preferences are more important than the worship of God. I know the challenges and have faced them when sporting events are scheduled during Sunday worship. There are hard decisions here, decisions which aren’t always clear. But do we not at some point subtly communicate to our children that public worship is and can be a secondary matter? Whether we mean to or not, when we choose family tradition, i.e. Christmas morning, over the worship of God (ostensibly the origin of that family tradition) we have chosen family over God. And that makes me sad. But you think I’m overreacting. I know. Maybe I am. What is one Sunday, after all? That’s an important question. It’s one Sunday, but maybe we need this Sunday more than most. It has been a hard year. It’s been hard for our family personally, but it has been hard for us all culturally. In the light of this past year, I was asked twice in one day this week how I keep pressing on through all the realities that threaten to pull us down. My response was, without any sense of pastoral piety, and without hesitation, “Advent.” Advent, of which Christmas is the culmination, keeps me going. This is not simply an ‘in house’ kind of hope. 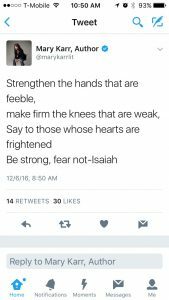 Memoirist Mary Karr, whose spiritual convictions are unknown to me and certainly not revealed on her Twitter feed, tweeted this week a quote she attributed simply to the prophet Isaiah. What we all long for whether we know it or not is the coming of One who will make things right. Worship on Christmas is not an interruption in our family lives. It is an act of desperate hope. If three or thirty or three hundred gather for worship on Christmas morning, it will be a time to bow before the one who has come and is coming, and to drink deeply of the hope we celebrate in the gifts we give. Heaven knows, we need it. We need Jesus. We need, in fact, a lot of Jesus.